Dolor R, Smith P, Hoffmann A, Schmit K, Nisbet K, Ales M. Raising Awareness…Starting the Conversation: Using Shared Decision Making to Treat Vulvovaginal Atrophy. Oral presentation at the 2016 North American Primary Care Research Group (NAPCRG) Practice-based Research Network Conference. July 11-12, 2016. Bethesda, MD. Regina Vidaver, PhD; Amanda Hoffmann, MPH; David Hahn, MD, MS WREN Research Agenda Development Oral presentation at the 2016 North American Primary Care Research Group (NAPCRG) Practice-based Research Network Conference. July 11-12, 2016. Bethesda, MD. Smith P, Dolor R, Ales M, Nisbet K, Ford A, Hoffmann A, Schmit K. Shared Decision Making and Changing Clinician Behavior for the Treatment of Post-Menopausal Vaginal Atrophy. Presentation at the 8th Annual Health Literacy Research Conference. October 13-14, 2016. Bethesda, MD. Hahn D, Hoffmann A, Felzien M, LeMaster J, Xu J, Fagnan LJ. Tokenism in Patient Engagement. Presentation at the 2016 North American Primary Care Research Group (NAPCRG) Conference. November 12-16, 2016. Colorado Springs, CO.
Amanda Hoffmann, MPH; David Hahn, MD, MS. Clinician and Staff Perspectives on Participating in Practice-based Research: A Report from WREN Oral presentation at the 2015 North American Primary Care Research Group (NAPCRG) Practice-based Research Network Conference. June 29-30, 2015. Bethesda, MD. Baumgardner D, Louks H, Fixmer J. Clinical Approach to Non-Resolving Pneumonia: A WREN Survey of Wisconsin Primary Care Clinicians. Oral presentation at the 2013 Wisconsin Health Improvement & Research Partnerships Forum. September 12, 2013. Chewning B, Kreling D, Hahn D. PEARL RX and WREN Partnership: Parallel Surveys to Explore Inter-Professional Collaboration. Oral presentation at the 2013 Wisconsin Health Improvement & Research Partnerships Forum. September 12, 2013. Leege E, Irwin A, Smith P. The Value of Research Participation for Practices: A Case Study. Oral presentation at the 2013 Wisconsin Health Improvement & Research Partnerships Forum. September 12, 2013. Farrell L, Steege L, Wiegmann D, Cartmill R, Hoffmann A, Du S, Wetterneck T. Exploring Primary Care RN & MA Cognitive Needs for EHR Design: A Qualitative Analysis. Presented at the 2018 International Symposium on Human Factors and Ergonomics in Health Care. March 26-28, 2018. Boston, MA. Du S, Wiegmann D, Hoffmann A, Steege A, Farrell L, Wetterneck T. Cognitive Task Analysis of a Primary Care Team: Exploring Cognitive Requirements for Addressing Preventive Care. Presented at the 2018 International Symposium on Human Factors and Ergonomics in Health Care. March 26-28, 2018. Boston, MA. Du S, Wiegmann D, Hoffmann A, Steege L, Farrell L, Wetterneck T. Cognitive Task Analysis of a Primary Care Team: Exploring Cognitive Requirements for Addressing Preventive Care. Presented at the 2018 University of Wisconsin-Madison Industrial and Systems Engineering (ISyE) Symposium. April 5, 2018. Madison, WI. Du S, Wiegmann D, Hoffmann A, Steege L, Farrell L, Beasley J, Smith P, Wetterneck T. Cognitive Task Analysis of a Primary Care Team: Exploring Cognitive Requirements for Addressing Preventive Care. Presented at the 11th Annual UW Madison Department of Medicine Research Day. June 15, 2018. Madison, WI. Hahn D, Johnson D, Mead R, Kennelty K. Linking Practice & Research; Cough Drops: Cause For Concern? Presented at the 2018 North American Primary Care Research Group (NAPCRG) Practice-based Research Network Conference. June 25-26, 2018. Bethesda, MD. Zgierska A, Hahn D, Nisbet K, Smith P Addressing Pain, Reducing Opioid Therapy Risk: System-Wide Quality Improvement (QI) Primary Care Intervention Presented at the 46th North American Primary Care Research Group (NAPCRG) Annual Meeting November 9 -13, 2018 in Chicago, IL. Farrell L, Wiegmann D, Steege L, Du S, Cartmill R, Hoffmann A, Tarnowski J, Beasley J, Hahn D, Smith P, Wetterneck T. Designing for Team Situational Awareness in Primary Care. Presented at the 2018 North American Primary Care Research Group (NAPCRG) Conference. November 9-13, 2018. Chicago, IL. Du S, Wiegmann D, Beasley J, Cartmill R, Farrell L, Hahn D, Hoffmann A, Smith P, Steege L, Tarnowski J, Wetterneck T. Who is my Team: An Insiders’ Perspective. Presented at the 2018 North American Primary Care Research Group (NAPCRG) Conference. November 9-13, 2018. Chicago, IL. Farrell L, Du S, Steege L, Cartmill R, Wiegmann D, Hoffmann A, Endsley M, Wetterneck T. Understanding cognitive requirements for EHR design for primary care teams. Presented at the 2017 International Symposium on Human Factors and Ergonomics in Health Care. March 5-8, 2017. New Orleans, LA. Farrell L, Du S, Steege L, Cartmill R, Wiegmann D, Hoffmann A, Endsley M, Wetterneck T. Shared Situation Awareness in Primary Care Teams: Implications for EHR Design. Presented at the 2017 Wisconsin Institute for Healthcare Systems Engineering (WIHSE) Inaugural Conference. March 16-17, 2017. Wisconsin Institutes for Discovery, Madison, WI. Farrell L, Du S, Steege L, Cartmill R, Wiegmann D, Hoffmann A, Endsley M, Wetterneck T. Shared Situation Awareness in Primary Care Teams: Implications for EHR Design. Presented at the 2017 Improving Primary Care Through Industrial and Systems Engineering (I-PrACTISE) Conference. April 10-11, 2017. Pyle Center, Madison, WI. Farrell, L, Cartmill, R, Beasley, B, Du, S, Hoffmann A, Smith, P, Steege, L, Tarnowski, T, Wiegmann, D, Wetterneck, T. How Can EHR Preferences Inform EHR Design? A Qualitative Case Study of the Cognitive Needs within a Primary Care Team. Presented at the 2017 Improving Primary Care Through Industrial and Systems Engineering (I-PrACTISE) Conference. April 10-11, 2017. Pyle Center, Madison, WI. Hahn D, Vidaver R, Zgierska A, Smith P, Boss D, Ales M, Nisbet K, Tuan W. Development of a Quality Improvement Activity to Augment Implementation of an Opioid Management Policy. Presented at the 2017 North American Primary Care Research Group (NAPCRG) Conference. November 17-21, 2017. Montreal, Quebec. Hoffmann A, Hahn D, Cartmill R, Du S, Farrell L, Tarnowski J, Steege L, Beasley J, Smith P, Wetterneck T. Understanding the Cognitive Requirements for Shared Situation Awareness to Design EHR Preventive Care for Primary Care Teams. Presented at the 2017 North American Primary Care Research Group (NAPCRG) Conference. November 17-21, 2017. Montreal, Quebec. Hoffmann A, Hahn D, Judge K. Boot Camp Translation in Primary Care Settings: A WREN Qualitative Case Study. Presented at the Progressing Together – Campus & Community Summit. February 5, 2016. Wisconsin Institutes for Discovery, UW-Madison. Cartmill R, Wooldridge A, Cheema S, Hoffmann A, Steege L, Du S, Beasley J, Hahn D, Smith P, Vidaver R, Wetterneck T. The Complicated Application of GDTA to Primary Care. Presented at the 2016 Improving Primary Care Through Industrial and Systems Engineering (I-PrACTISE) Conference. April 25, 2016. Pyle Center, Madison, WI. Betty Chewning, PhD; David H. Kreling, RPh, PhD; Nisa Sangasubana, PhD; David Hahn, MD, MS. The Power of Physician Referral for Pharmacist MTM Service Provision. Poster presentation at the 2016 Pharmacy Society of Wisconsin Annual Meeting. August 26, 2016. Wisconsin Dells, WI. Smith P, Dolor R, Ford A, Schmit K, Nisbet K, Ales M, Hoffmann A. Raising Awareness… Starting the Conversation. Presented at the 2016 North American Menopause Society Conference. October 5-8, 2016. Orlando, FL. Smith P, Dolor R, Ales M, Nisbet K, Ford A, Hoffmann A, Schmit K. Shared Decision Making and Changing Clinician Behavior for the Treatment of Post-Menopausal Vaginal Atrophy. Presented at the 8th Annual Health Literacy Research Conference. October 13-14, 2016. Bethesda, MD. Hahn D, Judge K, Hoffmann A. Boot Camp Translation in Primary Care Settings: A WREN Qualitative Case Study. Presented at the 2015 North American Primary Care Research Group (NAPCRG) Practice-based Research Network Conference. June 29-30, 2015. Bethesda, MD. Leege E, Irwin A, Judge K, Bockenfeld M, Hahn D, Temte JL, Barlow S, Schemmel A, Temte E, Haupt T, Residorf E, Wedig E, Shult P, Booker D, & Tamerius J. Back to the Future, With a Twist: Utilizing a PBRN for Real-Time Influenza Surveillance. Presented at the North American Primary Care Research Group (NAPCRG) Practice-Based Research Network Conference. June 30-July 1, 2014. Bethesda, MD. Beasley JW, Smith P, Stone JA, Krueger D, Holman T, Wetterneck TB. Workflow? Schmerkflow! The Myth of Workflow In Primary Care and Why It Matters for Health IT Design and Implementation. An I-PrACTISE Study. Presented at the 2013 North American Primary Care Research Group (NAPCRG) Practice-Based Research Network Conference. June 18-19, 2013. Bethesda, MD. Bockenfeld M, Hagenauer ME, Judge K, Louks H, Smith P, Wetterneck T, Karsh BT, O’Halloran P, Beasley JW, Stone JA. Involving Clinic Staff in a Large Randomized Control Trial: Balancing Study Goals with Maintaining Positive Relationships with Clinics. Presented at the 2013 North American Primary Care Research Group (NAPCRG) Practice-Based Research Network Conference. June 18-19, 2013. Bethesda, MD. Lipman P, Cohen R, Bockenfeld B, Knox L, Aspy C; Mold J. Implementation of Local Learning Collaborative (LLC) for the Diffusion of CKD Guidelines in a Multi-PBRN Quality Improvement Project: Description of Intervention Fidelity, Participant Attendance, and Guidelines Addressed. Presented at the 2013 North American Primary Care Research Group (NAPCRG) Practice-Based Research Network Conference. June 18-19, 2013. Bethesda, MD. Louks H, Judge K, Bockenfeld M, Leege E, Smith P, Hahn D. Using Statistical Software Efficiently and Effectively in Quality Improvement Projects. Presented at the 2013 North American Primary Care Research Group (NAPCRG) Practice-Based Research Network Conference. June 18-19, 2013. Bethesda, MD. Smith P, Snellman M, Arndt B, Beasley JW, Brown R, Hagenauer ME, Judge K, Stone J, Karsh BT, Wetterneck T. Physician and Patient Perceptions of Physician Knowledge about Patient Information During Primary Care Visits. Presented at the 2013 North American Primary Care Research Group (NAPCRG) Practice-Based Research Network Conference. June 18-19, 2013. Bethesda, MD. Hahn D, Guilbert T, Cowan K. Do Asthma Research Subjects Resemble the Patients Seen in Primary Care? 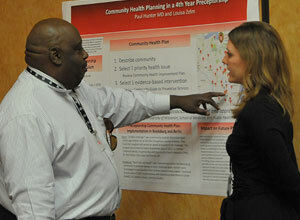 Presented at the 2013 Wisconsin Health Improvement & Research Partnerships Forum. September 12, 2013. Fisher M, Daly J, Hoffmann A, Michaels L, Murphy K, Howk S, Combe A, Dharam D, Dolor R, Chmielewski K, Guay-Bélanger S, Siddiqui R. Meta-PBRN Infrastructure: The PBRN Coordinator Role. Workshop presented at the 2018 North American Primary Care Research Group (NAPCRG) Practice-based Research Network Conference. June 25-26, 2018. Bethesda, MD. Hahn D. PRECIS-2: A Framework for Evaluating the Explanatory-Pragmatic Continuum in Clinical Trials. Workshop presented at the 2016 Improving Primary Care Through Industrial and Systems Engineering (I-PrACTISE) Conference. April 25, 2016. Pyle Center, Madison, WI. Baldwin LM, Hahn D, Nease D. Collaboration Between Primary Care and Public Health: Current State, Future Potential. Workshop presented at the 2016 North American Primary Care Research Group (NAPCRG) Practice-based Research Network Conference. July 11-12, 2016. Bethesda, MD. Pratt R, Baldwin LM, Hahn D, Nease D, Peterson K. Collaboration between Primary Care and Public Health: Current State, Future Potential. Workshop presented at the 2016 North American Primary Care Research Group (NAPCRG) Conference. November 12-16, 2016. Colorado Springs, CO.
Hahn D, Hoffmann A, Judge K. How the INSTTEPP Study Used Consolidated Framework for Implementation Research (CFIR). Workshop presented at the Institute for Clinical and Translational Research-Community-Academic Partnership (ICTR-CAP) Dissemination and Implementation 101: Pre-Conference Workshop. April 15, 2015. Madison, WI. David Hahn, MD, MS. How Do We Move Beyond Tokenism In Patient Engagement? Presented at the 43rd North American Primary Care Research Group (NAPCRG) Annual Meeting. October 24-28, 2015. Cancun, Mexico. Reyes H, Hahn D, Nagykaldi Z. PBRN Organization and Governance to Promote Practice, Clinician, Researcher, and Patient Engagement. Workshop presented at the 2014 North American Primary Care Research Group (NAPCRG) Practice-Based Research Network Conference. June 30-July 1, 2014. Bethesda, MD. Aspy C, Bockenfeld M, Lipman P, Lange C, Knox L. Practice Facilitation Evaluation: Case Studies From a CKD Guidelines Dissemination, Implementation and Diffusion Project in Primary Care. Workshop presented at the 2013 North American Primary Care Research Group (NAPCRG) Practice-Based Research Network Conference. June 18-19, 2013. Bethesda, MD. Nease D, Fagnan L, Rollins N, Michaels L, Winer T; Bockenfeld M, Hahn D, Legare F. Multi-Network Research Collaboration: Steps to Success. Workshop presented at the 2013 North American Primary Care Research Group (NAPCRG) Practice-Based Research Network Conference. June 18-19, 2013. Bethesda, MD.